Easy to read, easy to understand, and easy to apply, The 100 Absolutely Unbreakable Laws of Business Success offers a straightforward, eye-opening, life-affirming approach to how the world of business really works. Why are some people more successful in business? Why do some businesses flourish where others fail? Renowned business speaker and author, Brian Tracy has discovered the answers to these profoundly puzzling questions. 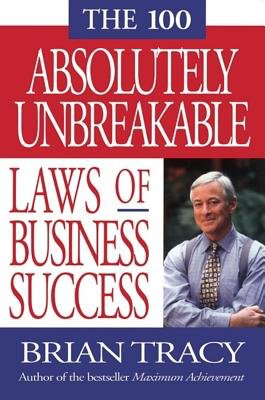 In The 100 Absolutely Unbreakable Laws of Business Success Tracy draws on his thirty years' experience and knowledge to present a set of principles or "universal laws" that lie behind the success of business people everywhere, in every kind of enterprise, large and small. These are natural laws, he says, and they work everywhere and for everyone, virtually without exception. Every year, says Tracy, thousands of companies underperform or even fail and millions of individuals underachieve, frustrated by thwarted ambition and dreams--all because they either attempted to violate or did not know these universal laws. But ignorance of the law is no excuse! This is a wonderful time to be alive. There have never been more opportunities for more people to accomplish more of their goals, both personally and professionally, than exist today. And if anything, our situation is getting better and better with each passing year. The only question that should concern you is, Does it work? And these ideas work. They work virtually everywhere, under virtually all circumstances in our business system. And the more you use them, the better they will work for you. The more you align your life with these laws and principles, the happier and more successful you will be. There are no limits.